This seedy and tasty fruit with rich red color has many benefits crucial to our health. It contains high amount of antioxidants and vitamins. The daily consumption of one cup of pomegranate juice can improve the heart’s health, protect from several types of cancer, even can help with erectile dysfunction. Pomegranate is rich in antioxidants that can help the detoxification of the body. It has large influence of the heart’s function and health overall. Lots of cardiovascular diseases can be prevented and the risk of gaining cancer can be lowered. It helps the blood vessels to be more flexible and prevents plaque depositing. Scientific researches revealed that pomegranate can cause apoptosis that is a process where cancer cell self-destruct themselves. 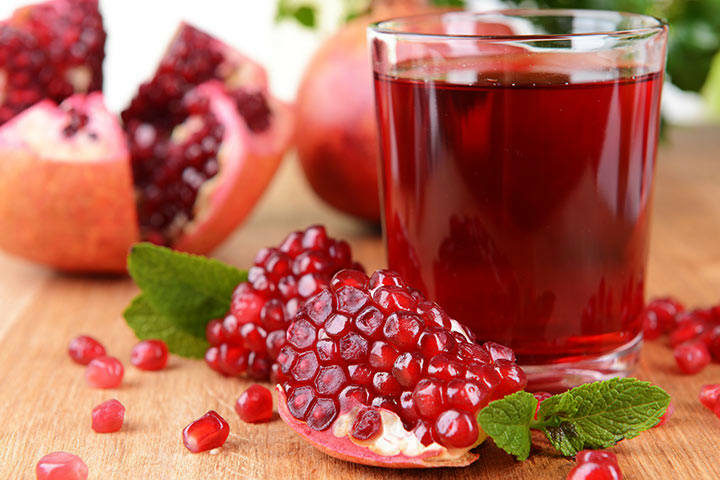 Pomegranate juice can lower the inflammation. Moreover its root of can do lots of benefits in the fight against many chronic diseases. From the big number of researches conducted for men’s erectile dysfunction, the results showed that it happens because of the close connection with the free radicals in the body. This juice is the key for solving the problems with erectile dysfunction because it is rich antioxidants, which are very helpful in the fight against free radicals. The risk of prostate cancer can be lowered by just one glass of this juice daily. This beverage is also good for the women’s health, especially for pregnant women. It contains folic acid which enables good blood flow and that is essential for healthy development of the baby. Also it contains high amount of potassium that keeps from legs stiffening– that usually appears in pregnant women. The growth of estrogen-responsive breast cancer cells is also prevented by pomegranate juice. You can prepare fresh pomegranate juice quickly and easily in your kitchen. Although is a great source of nutrients and vitamins you get only a small amount of juice from one pomegranate. Mix 1 cup pomegranate seeds and ½ cup water in a blender for 10 seconds. Then take a small glass bowl and pour the pulp through a sieve, while pressing it with a spoon, in this way you will squeeze all the pulp juice. Add the remaining cup of water, black salt, brown sugar and the fresh lemon juice. Mix well so the ingredients merge. Black pepper in powder can be added if you wish more pronounced taste and aroma. Serve the pomegranate juice over a few ice cubes for a better freshening effect. The remaining pomegranate seeds and pulp shouldn’t be disposed. They are rich with dietary fibers and mixed with salt and sugar give a nice and tasty meal. Serving Ideas: This recipe can be a good idea to begin the day or as refreshment after hard training in the gym.